Important victory of the Totana Promises in Murcia that leaves him 4th in the standings and maintains the options to continue fighting for the high places of the classification. First point at stake between the Murcian David del Olmo and Pedro M. Ruíz. Things were wrong with our team with Pedro's physical problems right at the beginning. 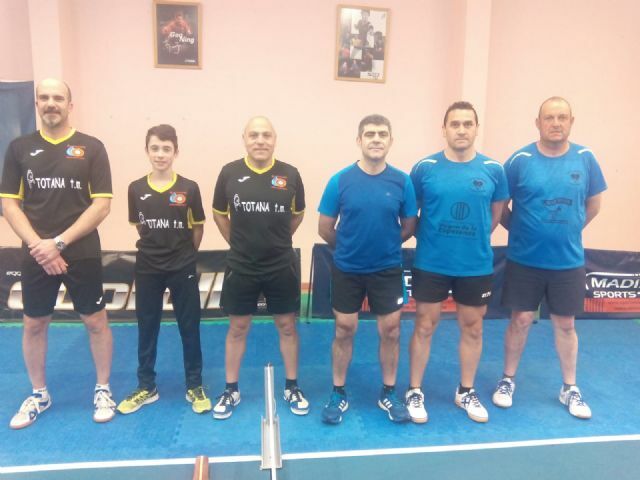 They did not prevent him from playing and reached the 2-2 with a final victory in 12-10 for the Murcian player. José Antonio Gallego put his team 2-0. Domingo Jr. could not take the initiative. He won the third game well but he escaped the fourth 9-11. José Luís Reverte won the first game to Santiago but the totanero reacted well to win the next two and thus put the 2-1 on the overall scoreboard. 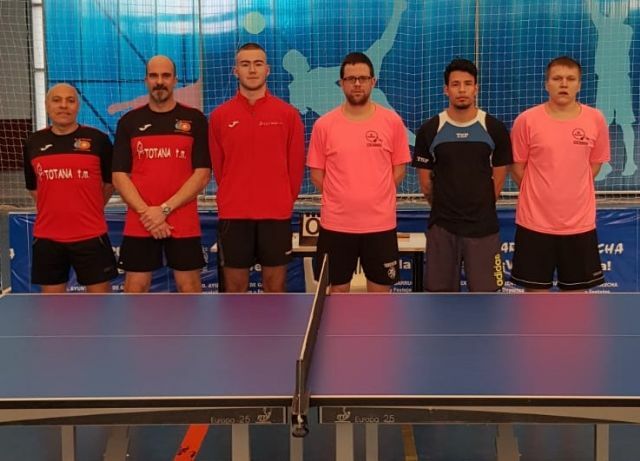 The Murcia arrived to send 3-1 in the general scoreboard with the victory of Del Olmo over Domingo Jr. All the games in two points of difference but 3-0 after all. 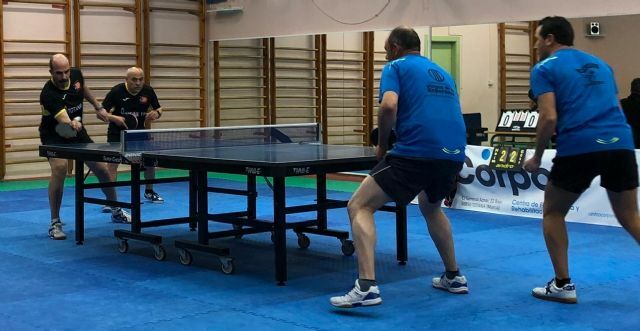 Reverte was able to resolve the game for his team but it was not like that and Pedro got a 9-11 in the fifth and final game by adjusting the overall score to 3-2. Another opportunity for the Murcian team. 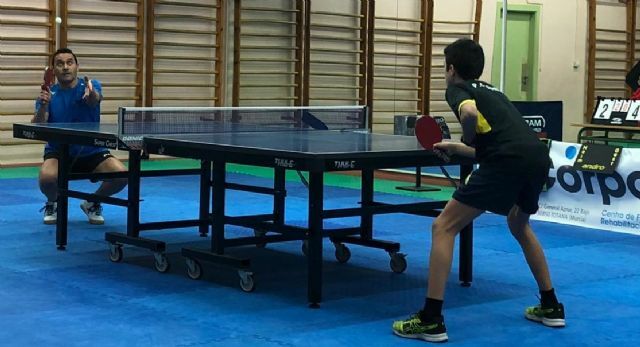 He won the first Galician game but again Santiago reacted to win 1-3 putting the 3-3 on the scoreboard and leading the game to doubles. Gallego and Reverte stood up to Santiago and Domingo Jr. but our partner was more solid and effective winning 0-3 and culminating the comeback of this long and exciting encounter. SAN JAVIER 1 --- TOTANA TM 5. Very good match of the other team of 2nd national of our club that moved to San Javier with Gabriel, Domingo and Vicente. The three were solid and showing a great level what earned them to take a clear victory against a team that was tied on points with the totaneros. The match between Francisco Javier Villaescusa and Vicente began in an even way until 1-1 but from here Vicente prevailed with confidence in his game. Jonathan and Gabriel played a good game. Good points from both players with an advantage for San Javier who won 3-1, putting the overall score in a draw. After another good match between Antonio Villaescusa and veteran Domingo. The totanero came out very solid and very complete in his game putting 0-2 and although the local player reacted winning the third game, again Domingo took the control in the next winning 1-3. Gabriel did not get the level shown in his first game but he knew how to push later and win the fourth and fifth games. The score was at 1-3 and Antonio Villaescusa went 2-1 with clear markers in his favor. It seemed that it would take the match to 2-3 but Vicente changed. He improved his attacks and above all his serves what earned him to overcome and leave the match resolved. In the last point Jonathan could not with Domingo that showed again his good game winning 0-3. Final score of 1-5 for the totanero team that moves away from the bottom of the table placing itself at the center of the classification and taking a victory and average over the San Javier team. 3rd NATIONAL: PHONE PC GARRUCHA 2 --- TOTANA B 4. Mariano, Alejandro and Vicente were the totanero players displaced to Garrucha to face the Phone PC Garrucha that lined up Tomas Urbonavicius, Miguel Riveros and Diego de Haro. First point for Totana B with Mariano's 3-1 victory over Tomas. Pedro José gave his point. Well Rivero that beat the totanero 3-0. Match very even after between Alejandro and De Haro with final victory for totanero with a tight 11-9 in the fifth game. Another game matched afterwards in which the great Mariano got his second point again (and there are already 5 this season). He beat Riveros well who gave in the fifth game 8-11. Alejandro left the match already solved. Not without difficulty because Tomas forced the fifth game in which the totanero won well. Pedro José returned to give 0-3 although he had options in the third that took De Haro 19-17. With this victory the Totana B is third in the classification of this Murcian group of the 3rd National. On Sunday morning, the postponed match of matchday 12 was played. They played Mariano, Pedro José and Pepe Carreño and the visiting team Miguel Ã�ngel Gil, Pedro García and Francisco Marín. Mariano won the first point to Miguel Angel Gil 3-0 and then tied the visiting team with the victory of Pedro Garcia over Pepe Carreño. The visitors were ahead because Pedro José could not with Francisco Marín who won 1-3. The next point served to equal the match to 2. Mariano again scored 3-0 beating Pedro Garcia. The next game was more than even and exciting until the end. Pedro José was 2-0 but then Miguel Angel won the next two games clearly. In the fifth and final maximum equality until it was resolved with a 16-14 that overtook the totanero team. In the last point of new equality. Good game Pepe that came to force the fifth game that was for Marin. We reached the doubles in which the couple Mariano / Pedro José was not effective, which they did Marín / García with which they took the points for Calasparra. The next weekend the totaneros teams of 2nd and 3rd national play at home their matches. 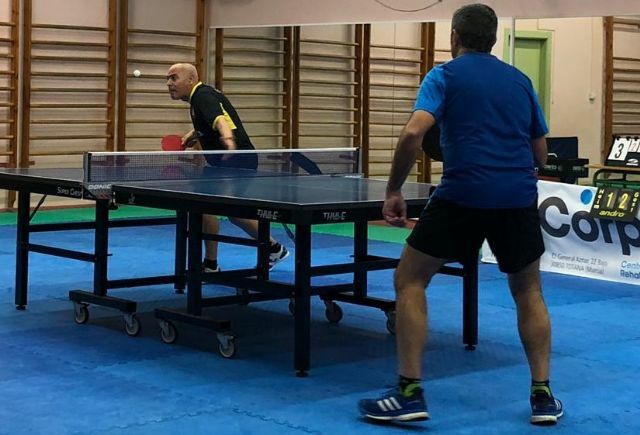 On Saturday morning at 10.30 am the Totana TM receives in the Manolo Ibáñez Pavilion the Mazarrón team in a match that the totaneros won and they would definitely forget the posts below and look more towards the top of the classification. On Saturday afternoon at 5:00 pm in the 2nd National Totana Promises will face Huntec Albacete and at that same time the 3rd National match will be played between Totana B and the La Nave team. 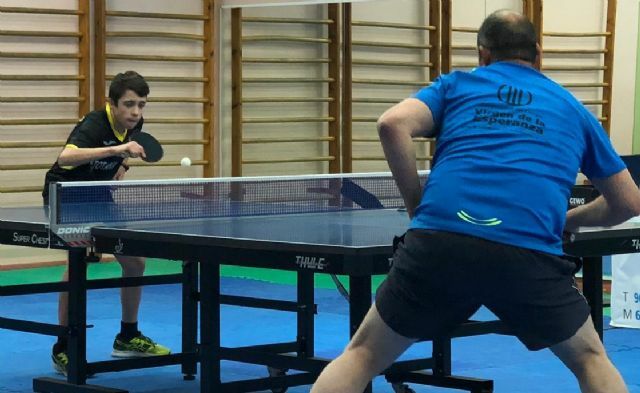 In addition, on Saturday morning there will be a day of concentration for the 1st autonomic in which the team of the Table Tennis School of the Totana Club participates. It will be played at the Cultural Center of El Palmar and our team will have two meetings. At 9 o'clock the rival will be team A of the Cultural Circle of El Palmar and at 11 it will be the team of Bacons Bridge.